If you are attempting to optimize the warehouse layout of a new or existing distribution center, it is essential that your design covers not only your typical day to day needs, but also any unforeseen circumstances which may arise. You can find a comprehensive detailed summary with professional recommendations in our complete article on Warehouse Layout Design, where we break down all of the main factors that must be taken into consideration during the design process of your facility. Here we point out the key factors that should form the base of your effective strategy. Are we taking full advantage of all available space? Can operators easily access all products? Is it possible to reduce handling times and distances? How much flexibility do we have for re-positioning inventory? Have we unintentionally created areas at risk for congestion? Have we clearly defined the space needed for each major operational zone? 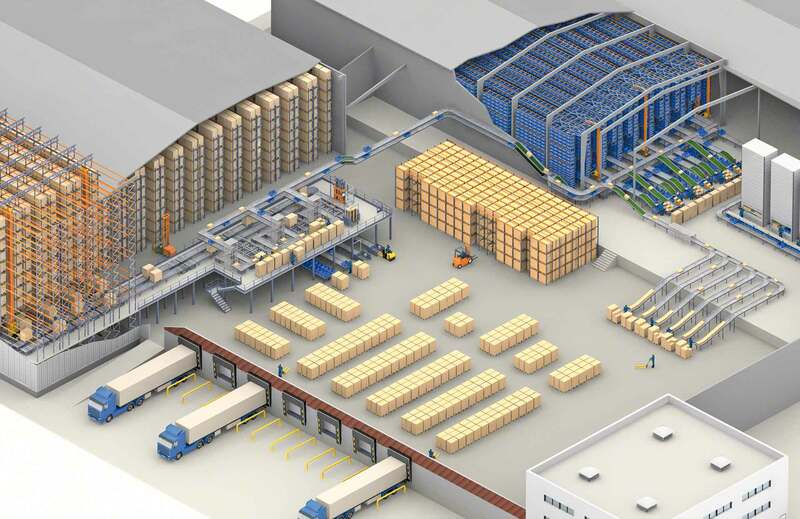 Well now that you’ve established the foundation for an organized warehouse layout, what additional information do you need to define in order to implement a more advanced and optimized design? Don’t waste an inch: make efficient use of the total facility’s cubic capacity. Find anything at any time: identify and implement racking systems and picking processes which allow for maximum levels of accessibility and accurate identification of materials. Keep things moving: ensure controlled and uninterrupted flow of products and staff while simultaneously maintaining real-time data regarding the location and movements of all inventory. Go faster (safely): consider inventory hazards, fragility, dimensions, weight and any other factors that will impact how each item is transported throughout the different stages that it is present in the warehouse and reduce distances between sequential handling activities. SKU characteristics and storage needs: identify necessary racking and picking systems along with special environmental requirements, such as temperature, humidity, lighting or possible safety installations for flammable or hazardous materials. Current habitual number of active SKUs: this will help you determine how much physical storage space is currently needed. Future forecasts for SKU volume: be sure to consider planned or possibly unforeseen changes due to expansion or shrinkage. Space optimization: Mobile racks eliminate the area occupied by multiple fixed aisles and allow operators direct access to goods through a single working aisle. Picking: Pallet shuttles and stacker cranes optimize operator movements and result in fast and accurate picking. Product handling: Conveyor systems are highly versatile and efficiently join warehouse workstations together for the safe transportation of goods. Inventory and workflow control: Warehouse management system software tracks and helps streamline all company logistics operations so that you are always in control and have access to real-time data. Whether you are designing your warehouse layout in-house or consulting with a professional, by previously identifying your available resources and having the above data clearly defined, you will be much better equipped to create a strategy for a highly organized and optimized facility.